Departure from Fethiye Harbour between 11 and 12 a.m. to Samanlik Bay for swimming & lunch or, depending on the sea conditions, to Butterfly Valley for lunch, a swim & optional visit of this natural reserve, hosting 136 kinds of different butterflies and moths. 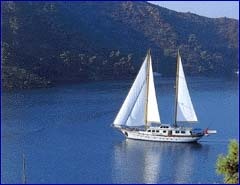 Afterwards we cruise to Oludeniz (The Blue Lagoon) again sea conditions permitting. Option for paragliding available. Last stop of the day is St.Nicholas Island. Byzantine ruins, swim, dinner & 1st night. After breakfast we have a look at the Pirates Cave (sea conditions permitting) before cruising to Andriace harbour (lunch). Bus transfer to the archaeological site of Myra, and to Demre for the St.Nicholas Church, shopping and banking when requested by your group. Bus transfer to the Tree houses in Olympos where we arrive between 4 and 6 p.m.